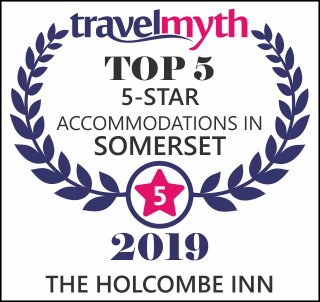 Treat yourself and your partner to a romantic escape at the luxurious Holcombe Inn with its Award Winning Restaurant & Bar in the heart of the Somerset Countryside. An 11 Bedroomed 5* Country Inn Hotel with an award winning Restaurant and Tranquility Gardens to totally unwind. Perfect for a hideaway south of Bath and ideally situated to explore Somerset's finest landmarks including Wells, Cheddar Gorge, Wookey Hole, Longleat, Bath and Bristol. We have 2 dog friendly rooms and we accept dogs in the bar and snug areas for breakfast, lunch and dinner service. We always have lovely vegetarian options on our menu and can cater for vegan and those with specific allergies on request. Thank you to all our valued customers for helping us achieve these accolades !